Friday April 25, 2014 - The thieving games of the rat and his cohorts - manipulating tax and other concessions in secret deals. 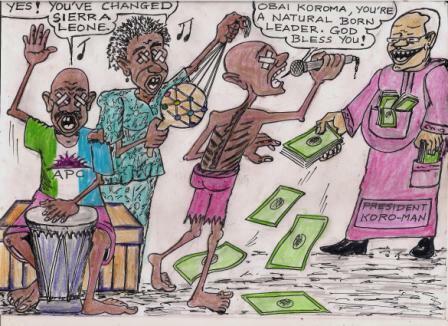 The APC and the duty free money-making machine. 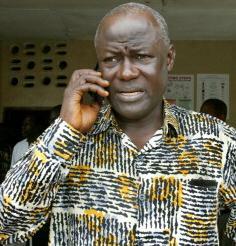 One fine day the truth will out as Sierra Leoneans discovered in the matter of one Michael Abdulai who went as far as to bequeath payment deals from the Sierra Leone Ports Authority. The government of the rat as well as all his operatives must have read the recent report from Christian Aid titled LOSING OUT REPORT in which the government's attention was brought to something it already knew about and failed to do anything concrete to correct because the entire scheme was in place to benefit the corrupt. "...transparent tax system supports good governance and the accountability of policy-makers towards the public. But the granting of special tax incentives in opaque deals, at the discretion of individual ministers, without public scrutiny, undermines good governance and can increase the risk of corruption...in Sierra Leone, parliament and the public lack information about the tax incentives granted and are usually not aware of the details until after they have been agreed, and sometimes not even then. It is currently impossible for elected parliamentarians, the media and civil society to scrutinise and debate these deals properly to ensure that the country optimally benefits." Put simply, it means that tax concessions, in the main, have not been approved by law makers whose duty it is to give such deals a legal tag and a true warning that when such concessions are made at the whim and caprices of individuals or groups without proper oversight, this leads to corruption. This type of corruption appears to be a money-spinner and a directive issued it seems for the rat and his operatives. It started off even earlier over that India rice scam when it was reported that a huge duty waiver was granted to one of the siblings of the rat who was made grand commander of the order of the rice from India and a deal which up to the time of writing this piece remains unexplained by all those involved, chief among them - the rat and one Zainab Hawa Bangura. Tax concessions are in themselves not a bad idea for a country recovering from the ravages of a war that left the country in great developmental reverse, but it must be stated that there's a limit to such and that when done it must be in a manner that benefits the country as an entity and not line the pockets of individuals in charge of ministries, state house and other government outlets. "Taxes raised from companies and individuals fund key public services needed to promote the welfare of the population and reduce poverty. But tax incentives granted by the government are a major reason for Sierra Leone’s low tax revenues. The UN estimates that Least Developed Countries need to raise at least 20 per cent of their GDP through taxes to meet the Millennium Development Goals by 2015. Yet Sierra Leone is way off this target, currently raising only around 10.9 per cent of GDP in taxes. The major tax incentives provided by the government include exemptions on customs duties and payments of the Goods and Services Tax, along with reductions in the rate of income tax payable by corporations, which are being granted supposedly to attract foreign investment. A transparent tax system supports good governance and the accountability of policy-makers towards the public. But the granting of special tax incentives in opaque deals, at the discretion of individual ministers, without public scrutiny, undermines good governance and can increase the risk of corruption. It is not suggested that any of the companies mentioned in this report have been involved in any illegitimate activity... In Sierra Leone, parliament and the public lack information about the tax incentives granted and are usually not aware of the details until after they have been agreed, and sometimes not even then. It is currently impossible for elected parliamentarians, the media and civil society to scrutinise and debate these deals properly to ensure that the country optimally benefits." "Tax expenditures could instead be spent on improving education and health services, investing in agriculture – the backbone of the economy – and in providing social protection to vulnerable groups. It will be impossible for the government to implement its poverty reduction strategy, the Agenda for Prosperity, without a large increase in revenue. Yet, in 2011, the government spent more on tax incentives than on its development priorities, and in 2012 spent nearly as much on tax incentives as on its development priorities. In 2012, tax expenditure amounted to an astonishing 59 per cent of the entire government budget. Put another way, government tax expenditure in 2012 amounted to more than eight times the health budget and seven times the education budget." Kindly re-read the last line so that you can grasp the enormity of what we see as a crime against the people. "Put another way, government tax expenditure in 2012 amounted to more than eight times the health budget and seven times the education budget"
Please read this section of the report's summary for an understanding of the deceptive nature of government pronouncements. "There are three major problems with government policy on tax incentives. First, too many tax incentives are granted to individual companies at the discretion of a very small number of ministers and officials. Such a system can lead to an increased risk of corruption and the possibility that deals will be offered to companies that are outside or go beyond national legislation. In fact, Sierra Leone’s constitution requires tax waivers to be approved by parliament. Secondly, related to this, transparency is extremely poor. Many of the tax incentives are negotiated behind closed doors between government and companies, with no effective parliamentary or media scrutiny. The government does not publish any figures on total tax expenditure. Thirdly, the government has produced no solid economic rationale for offering widespread tax incentives in Sierra Leone." We would again remind the nation wreckers sailing under the flag of the rat that one fine day, there will be initiated many hours of reckoning that will reveal all that is done in the dark as we witnessed in the wake of the historic event of April 29, 1992 when the autocratic, despotic and human rights abusing citadel of the "Live Forever" APC was brought down. We predicted and we knew that if given State House again, those who benefited from twenty four years of misrule would still be clamouring for the heads of those who dared to boot them out of power. We would again ask them to re-read the revelations recorded in documents of the Commissions of Inquiry instituted by the National Provisional Ruling Council, the NPRC so that they may know how the country was taken to the cleaners during twenty four years of thieving and undemocratic behaviour that made corruption the core of governance in those terrible days. They should again read about the section on one Michael Abdulai and the deal he cut with the agencies running the Sierra Leone Ports Authority. They should read again the battles between Finance Ministers and one particular female deputy at the ministry over the shape of the stamps that authorised duty concessions to many business outlets. Our message to the genuine investor - please keep all your files in order and ensure that you treat the people of Sierra Leone as you would want your own nationals to be treated in your own God-given country. For those "investors" who believe that they've never had it so good and are engaged in corruption and behaving as a part of the corrupt system, there will be a day of reckoning when your role in the political manipulations that deny the people their rights will be laid bare and you will be ordered to account to the people. We would therefore urge you to keep all records of transactions involving State House, the various ministries intact so that the people of Sierra Leone whose resources you are so ruthlessly exploiting will actually see just how far you played your part in the financial, social and economic mismanagement of Sierra Leone - and please do not forget too, your contribution to the political campaigns of the rat at State House who, we understand uses foreign currencies as if they were the legal and national currency of Sierra Leone. Offshore bank accounts and investments? The impoverished people of Sierra Leone shall know all in the fullness of time. For now another disciple of the rat heading the Anti Corruption Commission, one Joseph Fitzgerald Kamara refuses to see, with blinders on, the unexplained wealth of his political bosses. We await the day when he will account for his selective targeting of people his bosses want disgraced and punished.